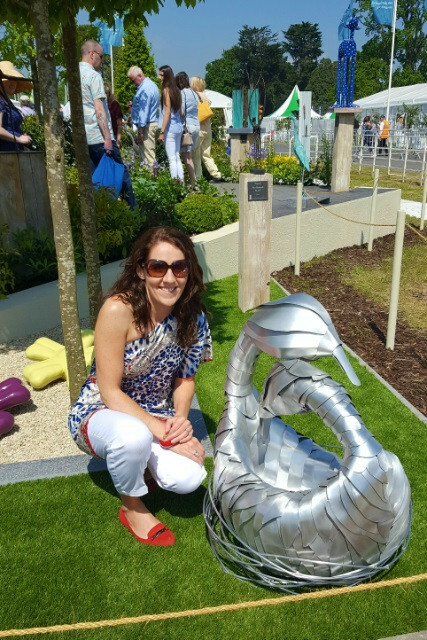 The sun was shining, the crowds had turned out and the Garden Sculptures had put on another award-winning Show Garden, this year sponsored by Kildare Gallery at Carton House. Ruth Liddle had an amazing selection of unique Irish sculptures, which were enhanced by the beautiful backdrop of formal hedges and soft colourful planting. ‘Eternal Embrace’ which was finished just in time for Bloom but more importantly was completed on my 10th wedding anniversary! My husband has been such a huge support and source of encouragement for me and that support was the main inspiration behind this sculpture.